The Spanish Riding School in Vienna is the only institution in the world which for more than 430 years has practised and continues to cultivate the art of classical equestrianism in the Renaissance tradition of the haute école. 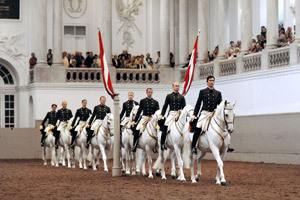 Experience this famous equine ballet in the baroque surroundings of the Hofburg Imperial Palace. Admire consummate horsemanship and enjoy the spectacular perfection of the diverse movements - from the pirouette to the capriole. The intelligent and lively Lipizzaner is the oldest European pure-bred horse and is derived mainly from Spanish, Italian and oriental bloodlines. With their compact, muscular bodies, grace and power these horses are ideal for this pure form of classical horsemanship. Visitors to performances witness the stunning manoeuvres of the Lipizzaners in the Winter Riding School, possibly the most beautiful indoor riding hall in the world. Designed by the master of baroque architecture Joseph Emanuel Fischer von Erlach, it was originally built to enable young aristocrats to take riding instruction. The precision in execution and lightness of movement of the Lipizzaners in perfect harmony with the music offer the audience an unforgettable experience.